Cortana is either a helpful voice-enabled artificial intelligence assistant or an annoying busybody that listens to everything you say. Here's how to disable Cortana, if you like. Click the Start button, type Cortana, and press Enter. Click the Notebook icon in its left-hand options pane (if it's not already selected), then select Settings from the list. Slide the slider control under “Cortana can give you suggestions…” all the way left to “Off.” Now Cortana is disabled, and all locally stored data she collected about your computing habits is deleted. The Edge browser is Microsoft’s replacement for Internet Explorer, and the default browser when you first run Windows 10. It cannot be uninstalled, but you can use another browser as your default. Just download Google Chrome or Firefox, open the browser, and find the “make default” button. In Chrome, it’s near the bottom of the Settings main page. In Firefox, it’s on the General tab of the Options page. Open either Settings or Options by clicking the “three bars” icon at the top of your browser’s main screen. Windows Defender is Microsoft's built-in anti-virus protection for Windows 8 and 10. It's essentially the same as the Microsoft Security Essentials tool that was available for Windows XP, Vista and 7. Third-party lab tests have found that regardless of the name, it's inferior to almost every other Internet security software available. And with so many free alternatives that do a better job of protecting you, it makes sense to turn off Defender, and leave the defending to one of the free antivirus alternatives that I recommend. Doing so will disable Defender. OneDrive is integrated into Windows 10 to facilitate online file storage and collaboration. Storing your files in "the cloud" with Microsoft OneDrive can make life easier if you have more than one computer, if you travel, or if you want to share files with other people. But if you use a different cloud storage tool (such as Google Drive) or you have no interest in cloud storage, you can disable the OneDrive feature in Windows 10. See this guide from Microsoft to Turn off or uninstall OneDrive. Some apps can be uninstalled easily; by “apps” I mean nagware like “Get Office,” “Get Skype,” and even the “Get Started” tutorial. “Phone Companion,” Microsoft Solitaire Collection, Money, News, and Sports are uninstallable apps, too. So are most bloatware apps installed by your computer’s maker. Just right-click on the app in the “All Apps” view of the Start menu, then select “uninstall” from the dropdown menu. Some Microsoft apps cannot be uninstalled this way. Fortunately, these stubborn apps can be removed with Powershell, a scripting utility built into Windows 10. Launch Powershell by typing “powershell” in the Start menu search box, right-click on the Powershell item that appears at the top of Start, and click “run as administrator” on the dropdown menu. Then copy and paste one or more of the following command lines (shown in bold below) into Powershell’s command-line window and press Enter. Telemetry is one more thing in Windows 10 that many users would like to eliminate. In a nutshell, telemetry is the transmission of data about your uses of Windows 10 to Microsoft. A lot of misinformation and FUD (Fear, Uncertainty, and Doubt) surrounds telemetry, but suffice it to say that no personally identifiable information is being sent to Microsoft HQ. Overall, I prefer to leave it on and give Microsoft automatic feedback about what my computer is doing if it crashes (telemetry’s real purpose) so MS can fix bugs. Most recent comments on "[TWEAK] Unwanted Windows 10 Features"
I keep getting pictures at start up asking me if I like them or not. How do I stop those pictures from appearing every time I turn on my PC? The referenced page for disabling or uninstalling OneDrive starts with the instruction to type gpedit.msc in the Run box. But when I do this, Windows 10 says it can't find gpedit.msc. Checked and rechecked the spelling, and that I was typing into the Run box, not the Search box. Any suggestions? "A lot of misinformation and FUD"? Just read the licence agreement carefully and you'll discover, that with Win 10 you don't own any info at your computer anymore and everything is at least owned or at most accessible by Microsoft. Also Microsoft has a new feature to remove some programs remotely. So I have no doubts about removing some parts of Win 10 and use for that some special program - Destroy Windows Spying (DWS) from http://dws.wzor.net/ that successfully removes all that garbage from Win 10, 8 and 7, marked all updates that contain them as ignored for any updates. By the way, don't be deceived that Win 10 spying on you only - 8 and 7 pretty long ago got updates that has similar functionality, so run that utility on them as well. The only problem that Win 10 has some spying functions at its core - in the kernel of operating system, so some spying is impossible to remove and this is the reason I avoid Win 10. Removing all those modules also gives you some extra performance of your operating system, since after you remove them, it leaves more resources for system to work faster. Question of trust to Microsoft is easy to solve - the module that force you to update to Win 10 and doesn't give any choice (two choices, actually - "now" or "choice for how long later, not forever") comes to you, as one of security updates. So do the math of how reasonable to trust Microsoft and keep updates on and in automatic mode. I am having the same problem as Art F has. Windows 10 says iit cannot find it. I even cut and pasted the name right from the MS website. Same result. Is there another way? I want to know how to get rid of the awful PHOTOS thing... once i have opened a photo, there is no clear way to save, rename, or even advance to the next photo in the folder, scroll through pictures, etc... extremely confusing and not user friendly. Please do an article on this... how to USE it and how to NOT use it and go back to thumbnails and clearly identified photo folders, etc. Thanks. I have the same complaint as Michael, "... once i have opened a photo, there is no clear way to save, rename, or even advance to the next photo in the folder, scroll through pictures, etc... extremely confusing and not user friendly. Please do an article on this... how to USE it and how to NOT use it and go back to thumbnails and clearly identified photo folders, etc. Thanks." This comment maybe off-topic. Concerning Bob's new Windows book 4th edition. I'm trying to order the download (if only to support Bob's site). But I'm required to enter full shipping address and phone number. For a download? Filled it in, reluctantly. I get the message that something is wrong with the information. Doesn't show what. Tried it twice. I now give up (and miss out on the special offer). Come on Bob, you're usually the Users' friend. Up with this treatment I will not put. Even though you make another browser your default - IE and Edge STILL collect cookies unless you turn that off in edge and IE entirely. I noticed this because I have the program "Cookinator" and it tells which browser downloads it, even if you don't have it "running". I guess it's running in the background. 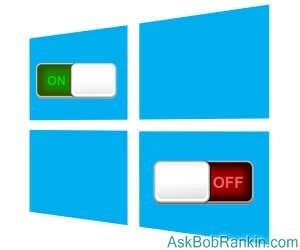 Thanks, Bob for the great tips on how to get rid of things on Windows 10. I cannot order the EBook because I only have a DISOVER Card----which is not an option on the order page. SORRY! I would also learn how to shut off the pictures at start up asking me if I like them or not. I have made Photo go away and use picasa as photo viewer. It is not perfect but at least I can go through my Pics. Not sure if you realize it Bob, but Internet Explorer is also another option along with the ones you mentioned for download. On three upgraded computers so far, I've had to dig and search a bit to find IE which evidently transferred during the upgrade. Better than Edge but it's always good to have Chrome and Firefox available on your machine as well. I enjoyed this article. I am interested in knowing how to find IE in Windows10. Is that possible, Bob? I need it because I use high screen enlargement, and a friend told me that EDGE doesn't enlarge well. On my version of Win10 I have "Diagnostic Policy Service", Diagnostic Service Host" and Diagnostic System Host" but no "Diagnostic Tracking Service" Is it safe to stop all three? IE is in Windows 10 just hidden away so you will not find it. If you open All Apps under the Windows Menu Button and look under the category Windows Accessories you will find it. You can right click it there and Pin it to your start menu, desktop, or as an App replacing edge. Or add it to your TaskBar. I believe you can also type Internet Explorer in the search box and it will take you to it as well. Your instructions for removing Cortana are outdated and don't work. After my attempt to "upgrade" from Windows 7 to windows 10 bricked my motherboard, I hold to the assertion that the most unwanted feature of Windows 10 is its desire to wreak havoc. I’ve been using Windows 7. Happily, because it seems with 7 Microsoft finally got it right. Is there any reason to switch to Windows 10? I asked this question once before without a single response, which suggests the answer is No.